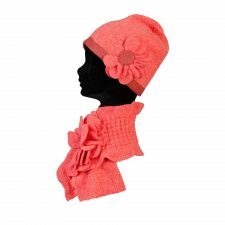 A beautiful lambswool hat and scarf in a gorgeous orange colour. Floral Beanie Hat: a beanie hat with a tweed trim and flower detail to the side, the middle of the flower has a tweed button. 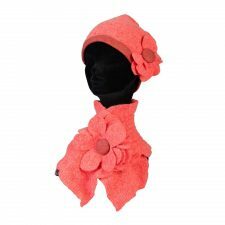 Corsage Collar: a collar scarf with a tweed button as the middle of the flower, which fastens the scarf. Irish hats and Irish scarves, creative Irish gifts created by Áine Knitwear, Co Clare, beautiful gifts for women made in Ireland. 100% lambswool, so soft and very comfortable to wear.